 SAFE & STURDY: The Ohuhu Hammock Chair is as tough as it is beautiful. The thick cotton ropes and premium iron chain are as strong as can be, supporting up to 265lbs of weight. This hammock swing is the most comfortable chair you’ll ever own. The ergonomic design cradles your body and takes the stress of your tired joints. It’s perfect for reading, relaxation, homework, meditation, and so much more. At Ohuhu, safe is our first priority. 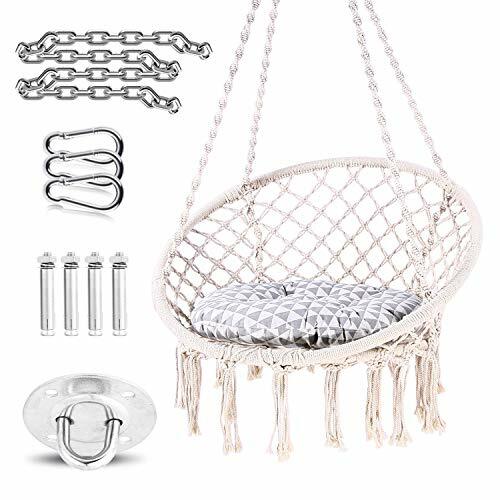 That’s why we use 100% hand-knitted bold cotton rope and high-quality iron hooks to craft this hammock chair swing! The high-quality material and tight weave will easily hold up to 265lbs and keep you from crashing to the ground.